Sticky Password is brought to us by former AVG Antivirus executives, and as you might expect, it takes online security very seriously with world leading encryption and ultimate user control. In our study of the leading password management tools, we found Sticky Password the best password manager for flexibility, and perfect for anyone really who wants to stay fully in control of their data. True, Sticky Password is perhaps not as well-known as LastPass or Dashlane, but it’s well-worth considering if you like taking extra precautions with all your sensitive information. We found Sticky Password one of the safest tools for storing private data: it uses AES-256 encryption (the same as the US military), with options for fingerprint scanning authentication back-up if you’d like too. But what really sets Sticky Password apart is how much freedom you have over how your data is shared using the platform. You can opt to sync via your local Wi-Fi, through the company’s air-tight cloud servers, manually offline, or over a USB stick – the choice is completely up to you. And if you ever want to wipe all your data, there’s no stopping you. 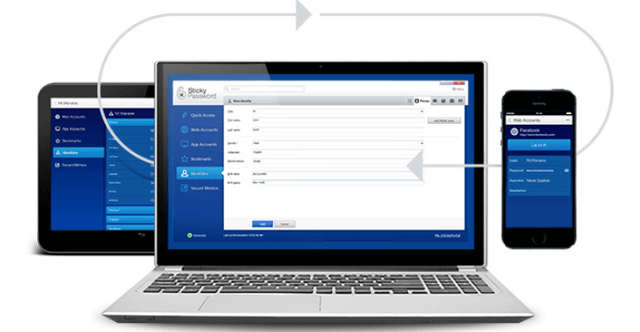 Overall, Sticky Password is affordable, easy and flexible. Logging in is simple, and you can run the programme on 16 browsers and on all four major platforms and devices. In this full-frontal Sticky Password review, we’ll give you a 360 tour of Sticky Password (from the pros and cons to real customer testimonials), so you can make the call on whether you’d like to go it a go. If you’d like to try out Sticky Password, you might like to know you can, commitment-free, with their 30-day free trial. 02 | Is Sticky Password for me? 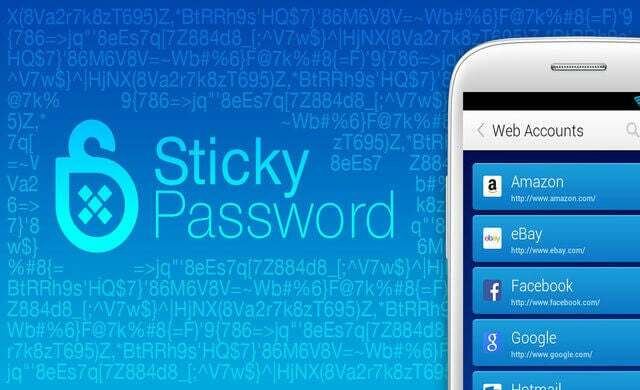 Sticky Password is the go-to password manager for those of us who like to take extra safety precautions when it comes to our online data. It uses AES-256 encryption, which is the leading standard in security, and even trusted by the US military. All the details you log there can be known to you only (not even Sticky Passwords can crack your codes). Sticky Passwords even goes one step further: you can protect your account using first-rate biometric authentication (also known as fingerprint scanning), and you can set up an auto-lock on any of your devices. Plus, you have more control over how and where you’d like to save your private information than with any other password management tool we tested. You only need to use the cloud storage if you want, and whenever you like, you can blitz your entire database, trace free. Sticky Password covers all the must-haves in password management, and some features (like the automatic login) it does really well. But there are a couple of quirks that just knock it off the top spot. Now, we’re not suggesting you choose your password manager based on looks, but still Sticky Passwords stands out for its a slightly outdated design. The dashboard is perfectly straightforward to use, though has the clunky feel of an old school computer programme. Then there a just a couple of features you may or may not be interested in: saving attachments (which is possible with LastPass), and directly adding web pages you’d like to bookmark to Sticky Password via the browser add-on (you need to do this manually). Is Sticky Password for me? You’ve no doubt read all about the countless hacking scandals that can bring even the biggest organisations to their knees. So, you probably already know you need a password manager. But which one would work best for you? If your priorities are security, flexibility and good value, Sticky Password was made for you. It’s easy to use and get set up – you just install, pick a master password and much of the rest is automated. Plus, no one decides what to do with your data but you, whether you want to store it online or offline. That said, it’s less likely to impress if you’re after a state-of-the-art dashboard or if you’re keen to hook up an entire workforce (if so, check out LastPass or Dashlane’s business options). Overall, the software is nearly as good as Dashlane (looks aside), but at a much cheaper price. 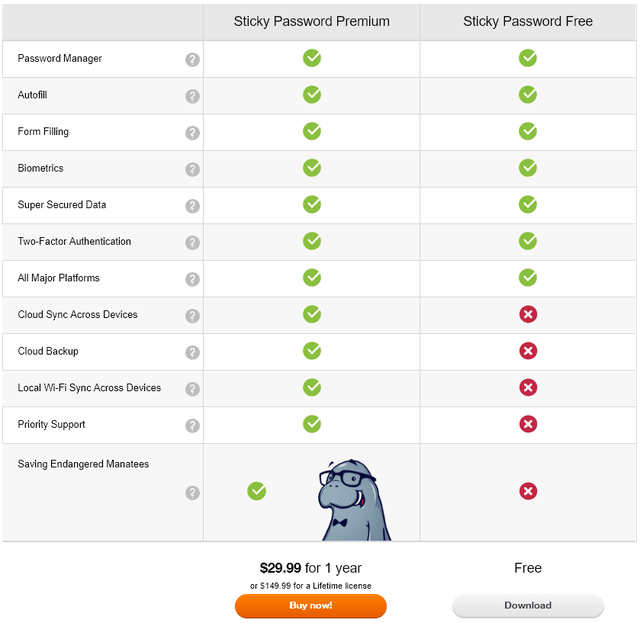 Sticky Password offers both a Free and Premium plan. The free version works just fine, but considering how on-budget the paid-for package is, we think it’s well worth paying for the extra peace of mind. With the Free subscription, you’ll still get to enjoy much of what Sticky Password has to offer, but the lack of cloud sync and multi-device access is pretty restrictive. It means if you lose whichever device you’ve installed Sticky Password onto, all that treasure trove of secure data goes with it, which we think is just too big a risk. The full shebang will only set you back around £1.90 (converted from $2.50) a month. That’s nearly half what Dashlane costs, and almost the same as LastPass. A Sticky Password Premium subscription also comes with a feel-good bonus (if you like helping endangered animals), as it supports the non-profit Save the Manatee Club. Another perk of Sticky Password is being able to opt for a £114 ($149.99) lifetime licence, which will start paying for itself after only five years. This option would make Sticky Password by far the most affordable way to store away your passwords throughout your life. There isn’t a specific small business plan (these often come at a premium), but plenty of small business owners and entrepreneurs use Sticky Password to make their work lives easier. Sticky Password handles all the basics in password management really well for you. But if you’re the cautious (or tech savvy) type, we think you’ll be impressed with what it lets you do yourself. Sticky Password has more syncing options than any of the other rivals we investigated. You decide what happens with your data, and are free to store it online or offline. Perhaps you’d like the flexibility of having all your encrypted passwords accessible across all your devices, wherever you go, and the cloud storage option is perfect for that. But you can also keep your data within tighter reach by just sharing your data using your own Wi-Fi network, so it never leaves your devices. Password managers are no fun if they’re a pain every time you need to use them. With the Sticky browser extension, you can log into sites seamlessly, even using different accounts. A major benefit of using password managers isn’t just to store your private data away securely – they’re also essential for keeping your passwords unhackable in the first place. With the Security Dashboard, you can run a simple check on your passwords to help you patch up any weak spots. This bit of admin will take slightly longer than on Dashlane (where it’s automated), but luckily you won’t need to do it that often. Alternatively, you can keep Sticky Password right in the palm of your hand with the portable USB version. Rather than downloading the programme onto your laptop, you can pop it on a USB, and run it on whatever device you choose (just make sure it’s one you trust). Mac users will already be familiar with Apple’s iCloud Keychain password management system. Sticky Password makes it easy to keep your encrypted password data on this cloud storage, so your iOS, Windows and Android devices are all in sync. Sticky Password is really a great find if you’re looking for a budget password manager that keeps your data as secure as can be, and managed however you choose. How does it stand up to competition? Dashlane takes the crown for the most intuitive design, but that comes at a price (around double, in fact), so Sticky Password would just about beat it if you’re more into your savings than snazzy software. Sticky Passwords covers everything you’re likely to need at great value. It’s nearly the same price as LastPass, but you get bags more freedom – and the lifetime subscription option makes it really quite hard to beat on price. If you’d like to try Sticky Password for yourself, you can start a free trial, absolutely risk free.